These days, it is not uncommon for an individual to have two or more active email accounts. 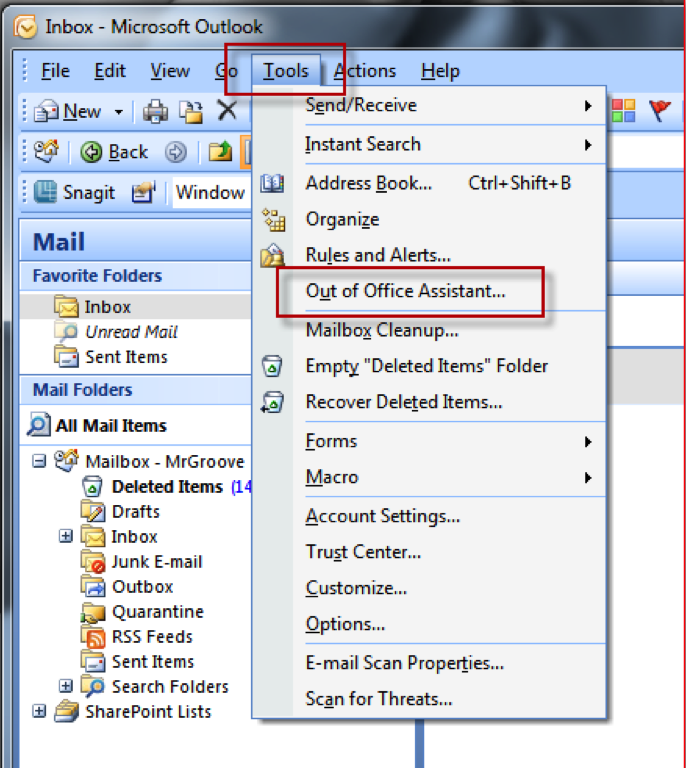 Using a tool like Microsoft Outlook allows users the ability to consolidate all of their email accounts into one convenient location. Outlook is not just an email tool, however. Outlook also integrates useful features such as a fully integrated calendar, task manager, and contact manager. 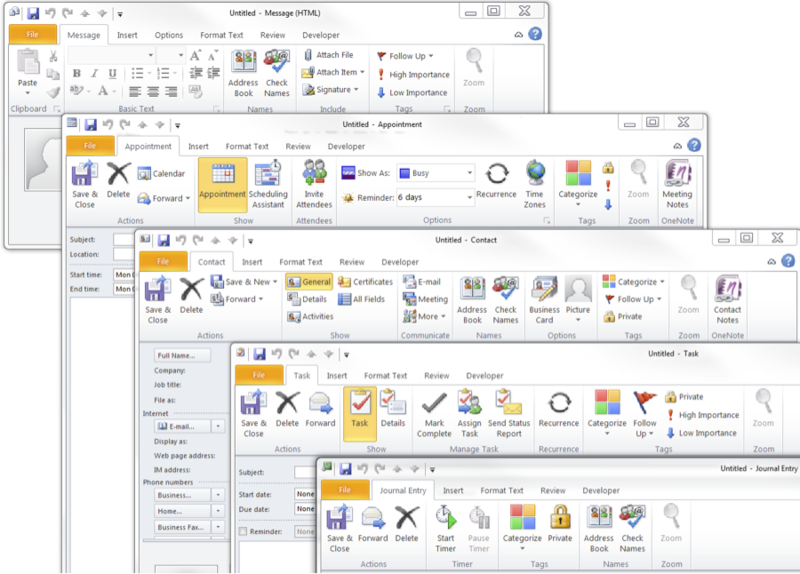 As it is with almost any Microsoft product, knowledge of the toolbar will help any user with ease of use. In Outlook, the toolbar is context based, meaning the toolbar will change based on whatever task you are currently working on. Managing your email is simple in Outlook. 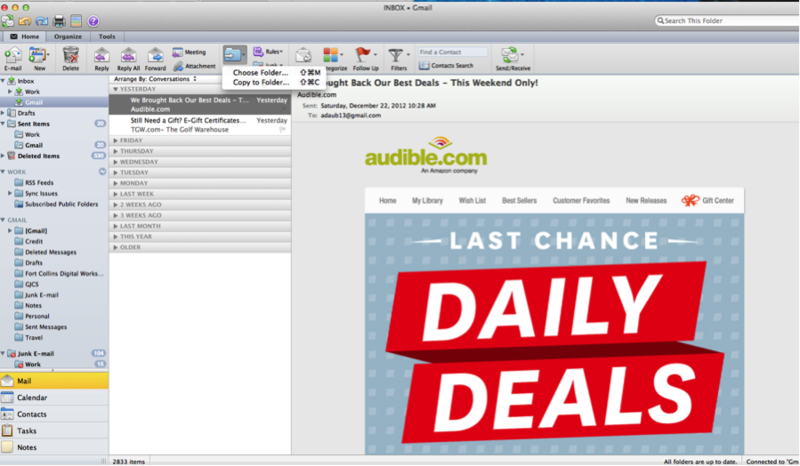 To compose a new email, simply select the email option from the toolbar. Email composition is pretty straightforward in outlook. From the composition screen, you will find options such as file attachment and inserting photos. You will notice that the blind carbon copy (Bcc) is conspicuously absent however. If this is a feature that you use regularly, it is very simple to add. Simply go to the options tab in the toolbar and select Bcc from the Show Fields Group. The Bcc will now be visible beneath Cc. Outlook’s “Contacts and Recent Addresses” feature comes in handy when you are emailing multiple contacts or if you are having hard time remembering your contact’s email address. 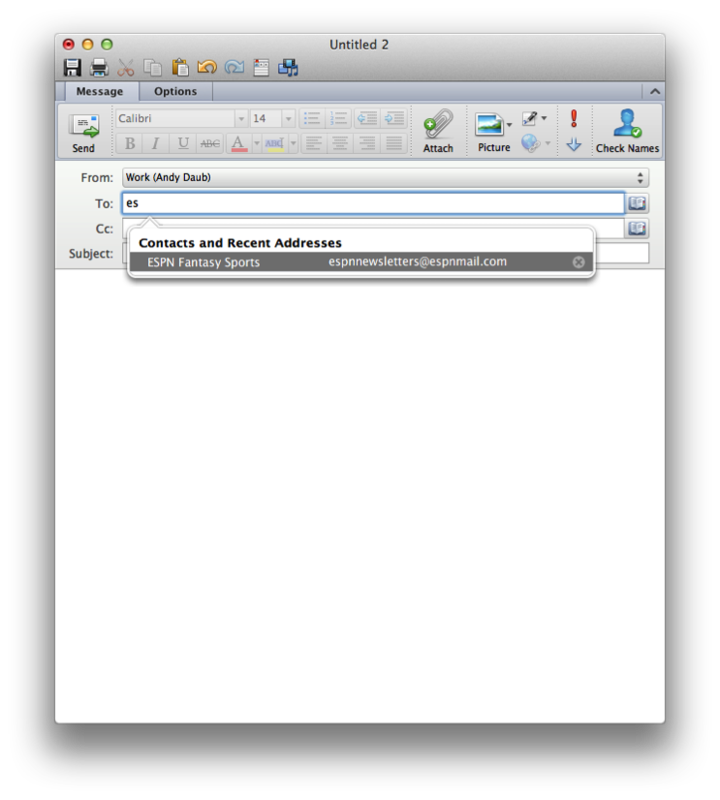 As soon as you begin typing the contact (either email address or name), Outlook will begin to either auto-populate or give you a drop-down list of predictive contacts. 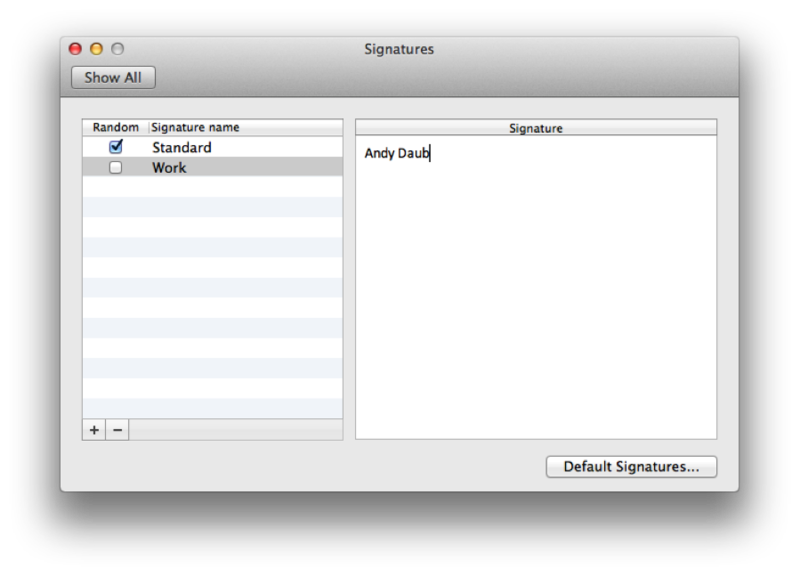 Creating your own unique “signature” is also simple within Outlook. Under the “Options” menu click the “Signatures” button. From here, you will be able to create as many signatures as you like, as well as set up whether you would like the signature to be attached to any outgoing message or you can have set so that you will need to manually insert it. 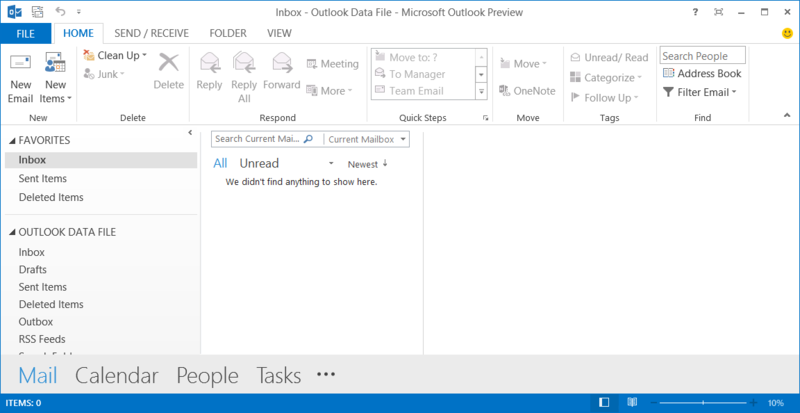 Outlook offers several features that help users organize and maintain their Outlook inboxes. The first and easiest option is to create folders in which you can store your most important emails. 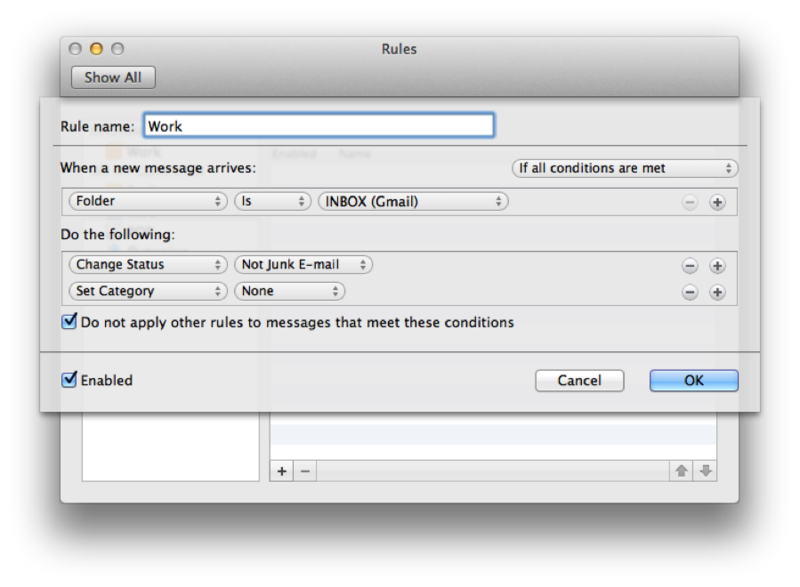 You can take this organization one step further with Rules in Outlook. While the menu may appear tedious at first, it is actually quite simple to set up. Rules allows you to set up certain parameters that automatically forwards your incoming emails to a specified folder if they fall within those pre-determined parameters. For example, if you would like all emails from your boss to be forwarded to a specific folder, simply create the folder that you would like to have the emails forwarded to and set the parameters so that any email from your boss is forwarded there. If you are looking for a travel deal to Palm Beach, you can have any email that contains the words “Palm, Beach, Deal” forwarded to a folder that you had created previously. Sometimes you just do not wish to be bothered. With Outlook, you can easily set up an “Away” message so that people know to not expect a reply right away. 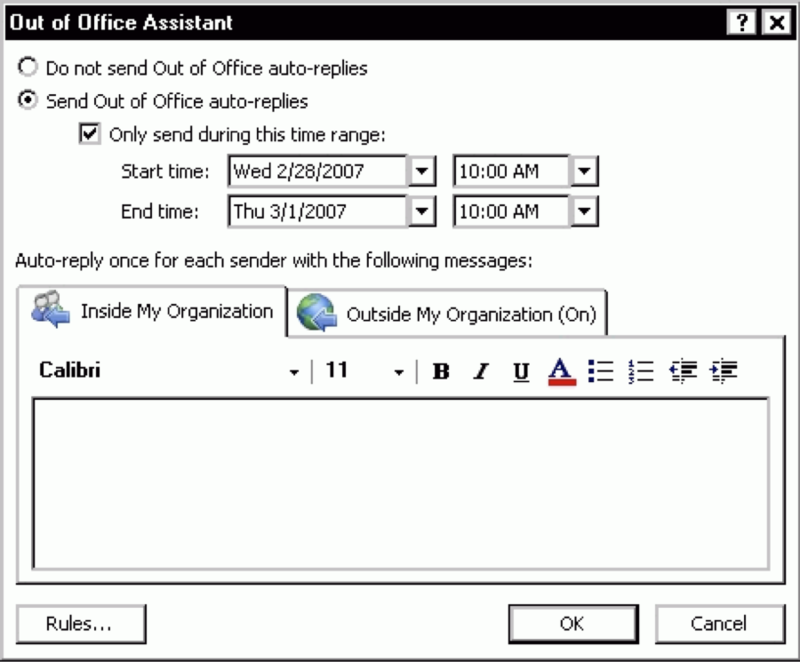 Microsoft has simplified this process by creating the Out of Office Assistant Wizard. You can access this set up menu by going to File Tab> Info> Automatic Replies. Creating parameters allows you to customize when automatic replies are sent out and what message goes to whom. 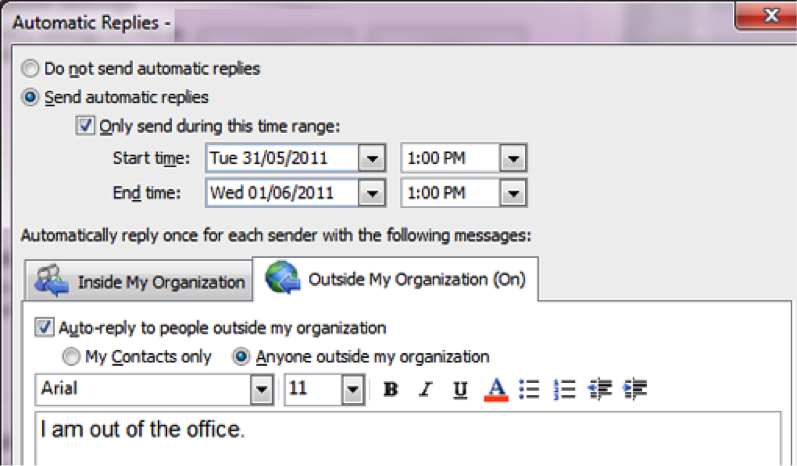 You can do this by setting specific time/date ranges that you wish to have automatic replies sent out. If you do not set these time ranges, automatic replies will be sent out to every message you receive. You may also want to have unique automatic replies contingent upon who is emailing you. With the Out of Office Wizard, you can create unique messages for people who are within your organization and people who email you from outside your organization. In the “Inside My Organization” tab check the “Auto-reply to people inside my organization” box and then compose the message that you wish to reply with. Click OK.
To set up a unique response for people who are emailing you from outside your organization, simply click the “Outside My Organization” tab. Be sure that the “Auto-reply to people outside my organization” box is checked. Finally, compose your message and click OK.